"I can’t imagine doing it without my mom," says a young woman volunteering with her mom to help separated families. SAN ANTONIO — What the government has torn apart by separating parents and children at the border, faith and charity are bringing together. 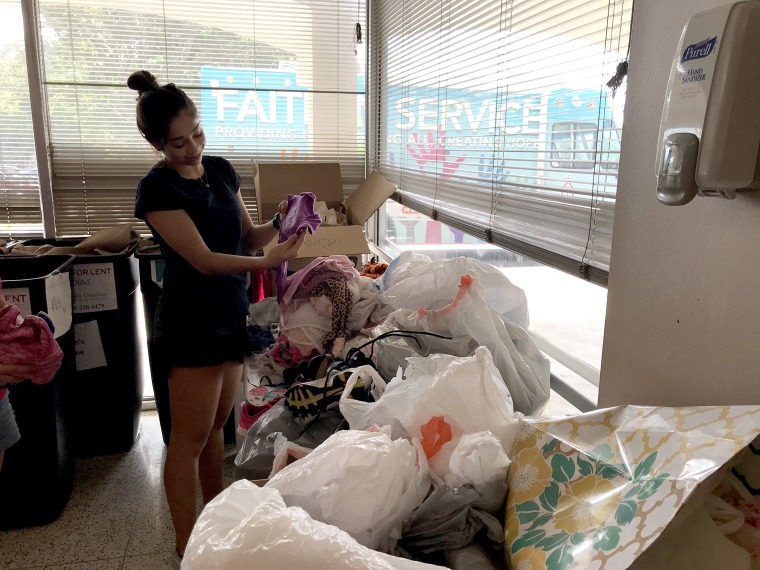 Mia Quintero, 20, and her mother Michelle Quintero, 53, were in a corner beneath a stairway at Catholic Charities San Antonio Tuesday sorting through donated clothing spread over a folding table. They logged items, bagged them up and put them in tall bins usually used to collect Lent donations. The clothing and other items pouring in from the community to Catholic Charities San Antonio are for the children who the federal government separated from parents or guardians at the border. Two families arrived Monday evening at the charity's office, but declined to speak to media. One family had already left on a flight out and another was setting up a ticket Tuesday morning. The Trump administration is now scurrying to comply with a court order to bring those families back together. Families that were affected have spoken of trauma and anguish of being pulled apart and separated by hundreds or thousands of miles. For the Quinteros, those separations reinforced their own mother-daughter bond. “I just can’t imagine what it would be like to be separated from parents,” Mia said. The two laughed and chatted together as they opened up cardboard boxes, moving on from clothing to used toys. Mia, who is studying fashion design, stopped to admire a purple onesie that said, “Stay away boys, my daddy works out” in silver lettering. She showed it to her mother, who agreed on its cuteness. Catholic Charities has been told to expect up to 400 families. But they are being given little information about when the families will arrive and where they are coming from. Attorneys with families in Port Isabel Detention Center in South Texas have said some of those families are being released but they are unsure where they are going, leaving the attorneys to hunt down their clients. Some adults have been taken to south Texas Detention Center in Pearsall, Texas. But other reunifications have been happening in other parts of the country. Government attorneys told a federal judge in a court hearing Monday that 2,480 of children in its custody that are ages 5-17 have been matched to a parent and 918 of the children’s parents had been cleared and were expected to be reunified by a court set July 26 deadline. When it got news of the arriving children, Catholic Charities put out a call for volunteers. Michelle said when she heard that call she decided she would help. She didn’t ask her daughter to join, but told her what she planned on doing.